You’ve heard the saying, “It takes a village to raise a child.” Well, it can take thousands of copepods to raise one larval fish. Our curator of fishes, Jay Hemdal, and I recently went to a grant-funded workshop in Bristol, Rhode Island, to learn how to hatch marine fish eggs and raise juvenile fish, in preparation for the Aquarium reopening in March, 2015. A lot of people don’t know what a copepod is, but it’s an important food source to larval fish. Copepods are tiny crustaceans, related to crayfish and water fleas, that young, or larval, fish eat. We want to increase our knowledge of hatching and raising our own fish from eggs, because it will reduce the number of fish we get from the wild for the new Aquarium. A grant from the Institute of Museum and Library Services (IMLS) covered the costs for me and Jay to attend a recent workshop at Roger Williams University in Bristol, Rhode Island, in conjunction with the New England Aquarium. This was the third time this workshop had been offered. Our workshop started with a tour of the facility where they receive marine fish eggs from aquariums all over the U.S. Their staff hatch out marine fish eggs, raise the larvae and send the juvenile fish back after they have passed the difficult first phase of their life. After our tour, we learned how to build what is called a MoLaRS. This is short for Modular Larval Rearing System. The grant also paid for our Aquarium to receive one of these MoLaRS systems, which will help us hatch marine fish eggs and then raise the larvae to the juvenile fish stage. Students at the workshop get hands-on experience. The first couple of days, we were shown how to take care of these systems in their lab. We fed the copepods and the larval fish, and we learned a variety of system maintenance tasks, from siphoning the detritus off the bottom, to cleaning the screens and changing the water. The Zoo’s Aquarium keepers built this new MoLaRS system in an off-exhibit area. Later in the week, we learned about culturing algae, rotifers and copepods. Algae is the food that the copepods and rotifers (other tiny marine animals) eat; these animals in turn are used to feed the larval fish. We have had smaller cultures of these in the past and have been somewhat successful. The crew at Roger Williams University told us that the copepods are the most important food animal to raise. 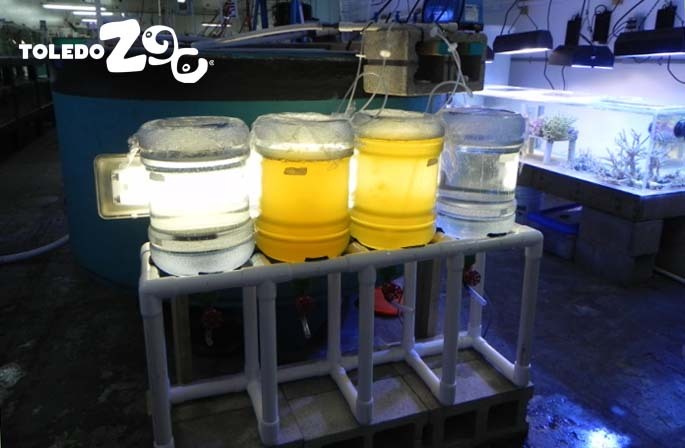 If maintained properly, these animals will constantly reproduce just the right sizes needed for larval fish rearing. The workshop included a visit to the New England Aquarium in Boston, where we learned about fish egg collection. We were shown how to set up collectors for large multi species exhibits. You never know what eggs you are going to collect in a multispecies exhibit; every egg has its own look. They showed us how to sterilize the eggs so they are free of harmful organisms that could affect their hatch rate. Some fish eggs are more difficult than others to raise. 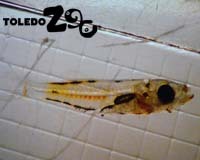 We have raised some larval marine fish in the past years at the Toledo Zoo, so we have already had some success. This workshop has helped us see some of the things we could do better. 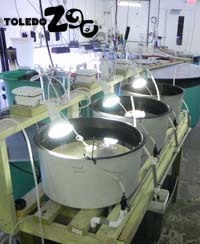 Even with the renovations going on in our Aquarium, we are hoping to be able to set up and use this system. So far, we’ve set up algae cultures in our off-exhibit holding area. We’ll use the algae to raise the feed animals (copepods and rotifers) for the larval fish in the new Aquarium. 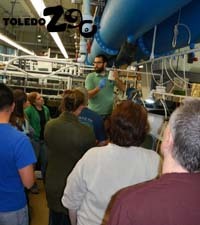 The Aquarium renovations are possible thanks to Lucas County voters’ successful passage of the Zoo’s 2006 capital levy, which has been enhanced by generous private donors. Want to be a part of this world-class project? A variety of donation options is available. Email Mary Fedderke, or contact her by phone at 419.385.5721, ext. 2074. Ask about fun new options in this year’s Medical Mutual Dart Frog Dash, too, where you can help raise dollars to purchase new fish for the Aquarium.